Well, not really. But with the sun so low in the sky – now that we are on daylight savings time, it sure LOOKS like evening! Here we have the UConn Marching Band bass drums warming up in the parking lot of the Met Life Stadium in East Rutherford New Jersey. The band was there to perform as the guest band at the USBands 2012 National Championship. I came down to shoot their performance in the stadium and was wandering around while they were warming up. 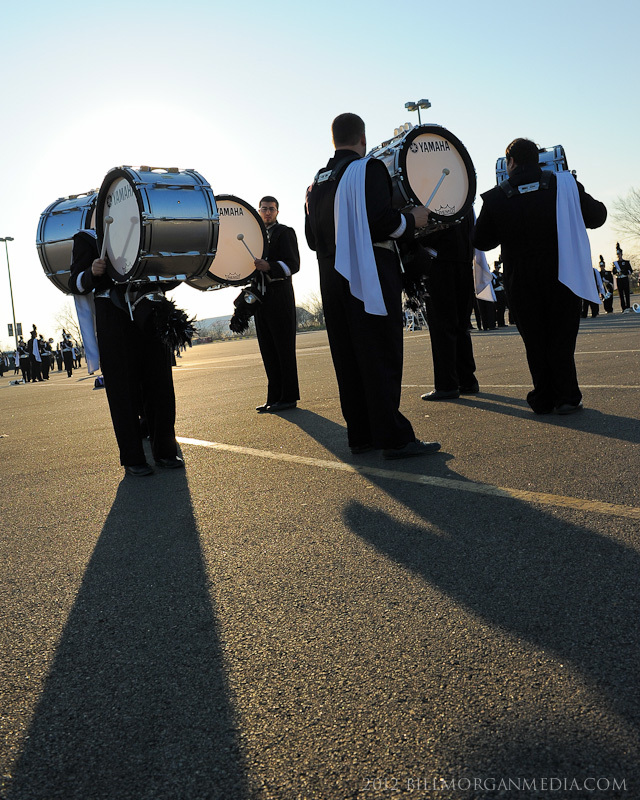 I was walking back into the sun after taking some shots of the tenor drums and saw the nice shadows that they were casting and decided to grab a shot of it. Unfortunately stadium officials would not allow the band to perform with the pyrotechnic equipment for the twirlers and drumline, but they put on a great show anyway!